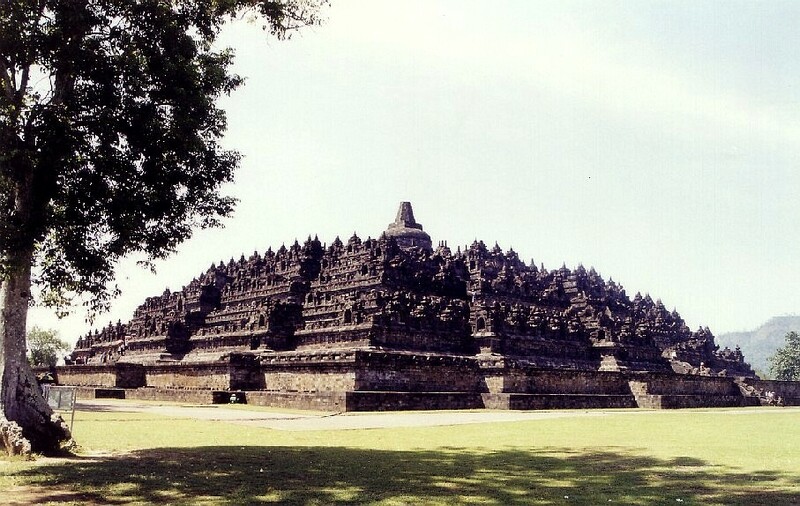 Borobudur is a ninth century Buddhist Mahayana monument in Central Java, Indonesia. The monument comprises six square platforms topped by three circular platforms, and is decorated with 2,672 relief panels and 504 Buddha statues. A main dome is located at the center of the top platform, and is surrounded by seventy-two Buddha statues seated inside perforated stupa. The monument is both a shrine to the Lord Buddha and a place for Buddhist pilgrimage. The journey for pilgrims begins at the base of the monument and follows a path circumambulating the monument while ascending to the top through the three levels of Buddhist cosmology, namely, Kamadhatu (the world of desire); Rupadhatu (the world of forms); and Arupadhatu (the world of formless). During the journey, the monument guides the pilgrims through a system of stairways and corridors with 1,460 narrative relief panels on the wall and the balustrades. A second inscription dating from 782 CE was discovered on the outskirts of the modern-day city of Yogyakarta to the south of Borobudur that commemorates the founding of a Buddhist temple. Called Kailasa in the inscription, the sponsor of this temple is identified as the "Lord of the Mountain" (Sailendra). 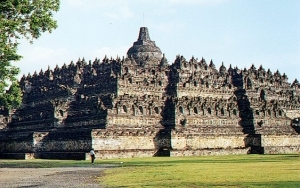 Several other Buddhist temples in the general vicinity of Borobudur, which were all constructed within a period of about 75 years, were constructed by members of the Sailendra dynasty. 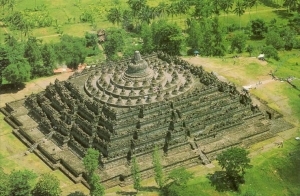 For this reason, historians have long assumed that the Sailendra must also have been responsible for the construction of Borobudur. The Kailasa inscription commemorates the founding of a temple dedicated to the patron saint of sailors, merchants and other travelers known as the goddess Tara. During the eighth century CE, both Buddhists and Hindus alike worshipped this particular female deity. Among other things, the name Tara means "star." The Buddhist scholar Alex Wayman has suggested that the goddess Tara may have once been associated with an ancient stellar cult. The name Tara is based on the Sanskrit root word "tar," which means "to sail across." Did Javanese sailors once associate the goddess Tara with a particular star that they once used as a night-time navigational aid during their journeys to and from the mainland? Other Javanese inscriptions have been discovered that allude to the fact that the Sailendra often entertained learned Buddhist monks from India and Sri Lanka, which suggests that the Sailendra were at the time involved in the burgeoning maritime trade between the island and the Asian mainland. The following lines from the Kalasa inscription also seem to suggest that Tara may have once played a stellar role in terms of ancient navigation. Dating from the time of the Kailasa inscription (778 - 782 CE), the discovery of the Stone of Ligor at a location on the Malay peninsula that is far removed from its base of power in central Java reinforces the perception that the Sailendra dynasty was once a major naval power in the region. Some additional support for this suggestion comes from the inscriptions of the Hindu kingdom of Champa, which formerly thrived in the area of southern Vietnam. These inscriptions record how black-skinned natives from the islands of the Southern Sea had once conducted raids along the Champa coast on at least three separate occasions during the late eighth century CE. "Indian influence in Indonesia was not primarily the result of Indian efforts to expand their sphere of influence and to export their own culture, but the fruit of Indonesian initiatives to assimilate those Indian elements that appealed to them and that seemed to fit best into the pattern of their own culture. The approach of the Indonesian who visited the Holy Land of Buddhism and Hinduism was an eclectic approach, one of picking and choosing instead of absorbing indiscriminately." 1. Prasati Indonesia, Volume II by J. G. de Casparis, p. 19. 2. Corpus of the Inscriptions of Central Java, Volume I by H. Sarkar, p. 37. 3. Cultural Horizons of India, Volume IV by Lokesh Chandra. The composers also recorded the year for each inscription in reference to the Hindu "Saka" era, which lags behind the Common Era of modern calendars by 78 years. 4. India in the Malayo-Indonesian World by H. Sarkar, pp. 333-334. 5. “The Yupa Inscriptions of King Mulavarman from Koetei East Borneo” by Vogel, J. Ph. p. 192.